LEAF ’s Integrated Farm Management and the tools available to you as a LEAF member, have really helped increase our awareness and understanding of the environmental impact of our farming practices. As farmers, we see ourselves as custodians of the countryside. We’ve always tried to balance our need to run a profitable farming business with care for the environment. By doing the LEAF Sustainable Farming Review and attending LEAF’s technical field days, we’ve made a number of changes to the way we farm that have had huge environmental benefits. 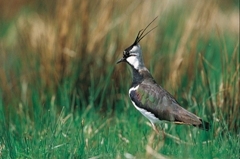 For example, we’ve seen significant increases in bird species and doubled our number of lapwings. Insect life has also increased hugely and some very rare wild flowers have reappeared on the farm, including meadow clary. I think the attention to detail demanded by an Integrated Farm Management approach has really helped improve the biodiversity on the farm. I really believe our LEAF membership has also helped to present us in a much more favourable way when we applied for the Higher Level and Countryside Stewardship Scheme.